However, the Belmond Grand Hibernian did not have a full operational season last year. 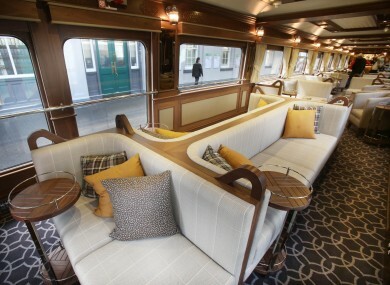 THE LUXURY BELMOND Grand Hibernian Irish train lost almost half a million euro in its first operating period, according to new figures. Belmond, the same company that operates the famous Orient Express, announced in 2014 that it was planning to launch an Irish sleeper train. The service can accommodate 40 passengers on trips around the North and Republic of Ireland. Journeys last between two and six nights. The train ran between August and October 2016 before breaking for the winter. It was only launched in August, so it did not have a full operational season last year. It will have a full operational season in 2017, running from the end of April to the start of October. A two-night trip for an adult costs about €3,000, while a six-night trip is in the region of €7,000. Belmond operates high-end hotels, restaurant, trains and river cruise properties in almost two dozen countries. Announcing its latest set of annual results, the company said that its Irish train had losses before exceptions of $400,000 (€380,000). “Belmond Grand Hibernian, the company’s new Irish train which commenced operations in August 2016, recorded a $0.4 million EBITDA (earnings before interest, taxes, depreciation, and amortisation) loss largely as a result of seasonality,” it said. As well as en-suite accommodation, the Belmond Grand Hibernian includes two restaurant cars and an observation bar car. The experience is intended to function as a type of ‘land cruise’, with the train stopping at destinations around the country and allowing guests to take part in organised activities or go explore by themselves. Three different options are on the table for two, four and six nights. The shortest sees the train visit Belfast from Dublin before going to Waterford, while the four nighter travels from Dublin to Cork, Killarney, Galway and Westport. The six-night option is a combination of the two . Those using the Grand Hibernian Irish get a 24-hour steward service and ‘traditional entertainment’ while on board, as well as visits to Irish tourist sites such as the Titanic Experience and the House of Waterford Crystal. The Belmond Grand Hibernian’s haulage services and Dublin depot are provided by Irish Rail. The train broke down on its first weekend in service due to a technical fault. Several of the nights for the new 2017 season are already sold out. Email “Ireland's answer to the Orient Express train lost almost half a million euro”. Feedback on “Ireland's answer to the Orient Express train lost almost half a million euro”.